This week Chanel unveiled it's latest look of the season with the new Spring/Summer 2012 Ad Campaign, offering a modern revival of classic 1920's Chanel with a luxe sportswear twist. 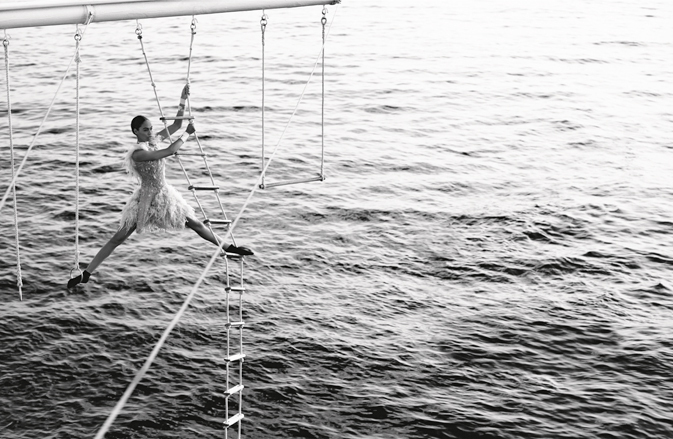 Shot at the scenic Hôtel du Cap-Eden-Roc in Antibes, France by Lagerfeld himself, the campaign features gymnasts Joan Smalls and Saskia de Brauw in a stunningly sporty flourish. Twenties flapper beading and delicately pleated chiffon meet luxury swimwear, sporty ankle socks and the classic Chanel suit in a beautifully androgynous campaign - A nod to the Olympic year perhaps?